What is probate, and why should you avoid it? 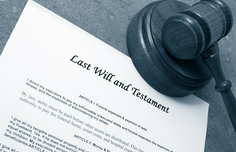 Probate is a court proceeding during which the will is reviewed, executors are approved, heirs, beneficiaries, debtors and creditors are notified, assets are appraised, your debts and taxes are paid, and the remaining estate is distributed according to your will (or according to state law if you don’t have a will). Probate is costly, time-consuming and very public. A living trust, on the other hand, allows your property to be transferred to your beneficiaries, quickly and privately, with little to no court intervention, maximizing the amount your loved ones end up with. A basic living trust consists of a declaration of trust, a document that is similar to a will in its form and content, but very different in its legal effect. In the declaration, you name yourself as trustee, the person in charge of your property. If you are married, you and your spouse are co-trustees. Because you are trustee, you retain total control of the property you transfer into the trust. In the declaration, you must also name successor trustees to take over in the event of your death or incapacity. Once the trust is established, you must transfer ownership of your property to yourself, as trustee of the living trust. This step is critical; the trust has no effect over any of your property unless you formally transfer ownership into the trust. The trust also enables you to name the beneficiaries you want to inherit your property when you die, including providing for alternate or conditional beneficiaries. You can amend your trust at any time, and can even revoke it entirely. Even if you create a living trust and transfer all of your property into it, you should also create a back-up will, known as a “pour-over will”. This will ensure that any property you own – or may acquire in the future – will be distributed to whomever you want to receive it. Without a will, any property not included in your trust will be distributed according to state law. After you die, the successor trustee you named in your living trust is immediately empowered to transfer ownership of the trust property according to your wishes. Generally, the successor trustee can efficiently settle your entire estate within a few weeks by filing relatively simple paperwork without court intervention and its associated expenses. The successor trustee can solicit the assistance of an attorney to help with the trust settlement process, though such legal fees are typically a fraction of those incurred during probate.